A power meter that never misses a beat. InfoCrank is designed from the outset as an integrated cycling power meter and beautiful road bike crankset. 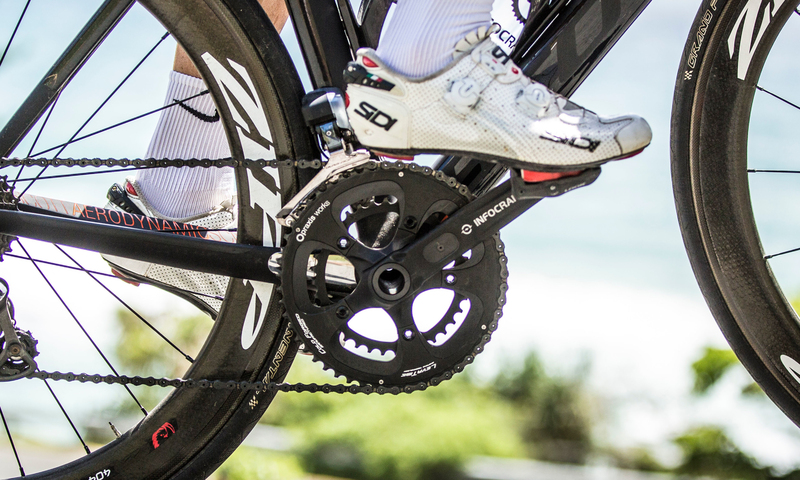 Seamlessly set into the crank arms, InfoCrank’s power meter measures each leg’s power with unprecedented precision. No guesses, no maths, just an honest set of numbers that reflect unsurpassed accuracy. The load path, from bike pedal through crank and bike chainrings, is optimised to transmit only the torque that moves your bike forward. What power is going in? That’s what moves the bike forward. Heart rate, speed, cadence, time, distance-all outputs. To get results from your cycling training, you need to know input power. That’s the info you need, and that’s what the InfoCrank cycling power meter measures like no other. Improve your bike performance with accurate torque and cadence measurements in both left and right legs. Available to purchase or rent online with a range of sizes and specifications.